Packing up for Mexico is like cramming for an intense, two-hour Final. No many how much time we put in, we never feel completely prepared. We don’t take so many clothes because we wear bathing suits (or the same old thing) a lot of the time, but there are towels and sheets and blankets and pillows and camping gear (folding chairs and table and mini-fridge and cookstove) and schoolbooks and paperbacks and magazines and DVDs and iPods and Christmas presents (Santa’s need to be carefully stowed) and wrapping paper and First Aid supplies and toiletries and dog accoutrements and dishes and cutlery and food. I always bring a bunch of canned beans—ridiculous, going to the land of frijoles—but I prefer organic. Same with nuts and seeds and dried fruit. And we never have enough of our favorite cereal, it seems, or low-sugar ketchup, yogurt, and peanut butter. We can’t start too much of the process ahead of time, because, of course, our four-year-old wants to help, and that means taking every pot, pan, and can of food in the pantry. Last year we ended up carting her entire, kid-size kitchen south of the border, and this year, nearly every stuffed animal in her collection (approximately 36). Oddly, our eight-year-old declined any toys this time, preferring to play with “found” objects”—sticks and rocks and other bits of detritus he picked up along the way. I had to beg him to pack a few LEGOs. We usually organize what we can at night—after the kids have gone to sleep—and cart out the rest of it in the morning. 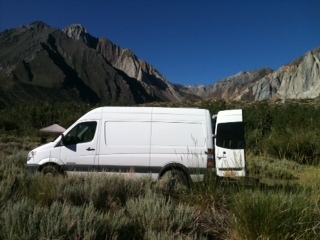 Fortunately, we’ve got a gi-normous white Sprinter van that Oz uses for work. We’d had our eye on them from the time Mercedes started importing them from Europe, but it took us about five years to find a used one that we could afford (ours is a Dodge). It’s big and roomy inside–eight feet tall–with tinted windows and a special “landscape” view on the sliding door. The dogs love watching the scenery whizzing by. In the back area there’s a bench seat with seatbelts, and behind that is a large mattress on top of a frame. Oz built a little partition with an extra mattress that goes over the bench seat at night, so that all four of us can sleep in back. (Dogs sleep in the front seats.) This may have to change, as the kids are getting longer! When everything is done and the trash is taken out and heat had been lowered and the alarm set and the plants kissed goodbye, we get on the road and phone our last few friends and relations, to tell them we’re on the road. Hasta Luego! This entry was posted in Uncategorized and tagged Mexico, parenting, road trip, Sprinter, Travel, vans on February 19, 2014 by Lillian Gilmour.